The Tesla Model 3 was dubbed “the $35,000, 200-mile Tesla,” but so far it’s only available in the Long Range 310-mile version—usually running $50,000 or more out the door. The 2018 Tesla Model 3 promises Tesla chic at mass-market prices, at least when less expensive versions arrive, but build quality should be any buyer’s biggest worry. The 2018 Tesla Model 3 is the car intended to take the Silicon Valley electric-car maker to the next level of volume: hundreds of thousands of cars a year. Its long and bumpy path to mass production started in July 2017 and has continued well into 2018, with just a few thousand delivered in its first six months. Several versions have been announced: the Long Range model with 310 miles of rated range, the standard Model 3 with 220 miles, a coming all-wheel-drive version, and a performance variant that also includes all-wheel drive. We were able to spend several hours and cover more than 100 miles in a Model 3 Long Range version, varying highway cruising with twisty mountain roads and stop-and-go suburban errand duty. Despite multiple and glaring quality problems, the Model 3 essentially delivers on the promise of a lower-priced Tesla with 200 or 300 miles of range. As of spring 2018, only the priciest Long Range models are being delivered, so those who really want the $35,000 base Model 3 will wait many months, perhaps more than a year, to take delivery. Recognizably a Tesla, the Model 3 is roughly the same size as a BMW 3-Series, the definitive sport sedan for decades. It’s a four-door sedan with a small trunk opening, rather than sharing the five-door “hatchback sedan” layout of the larger Model S, though both cars share a fastback shape. 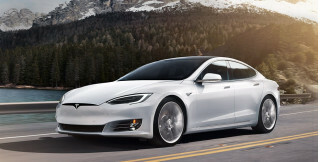 Its front end has Tesla’s bluff, rounded nose with a V-shaped Tesla emblem and without any pretense of a grille. The Model 3’s interior is plainer than those of its larger siblings, and its most striking feature is the 15-inch touchscreen sitting above an otherwise empty dash, free of buttons, switches, knobs, or sliders. Aside from steering-wheel controls and stalks for lights, wipers, cruise control, and audio settings, every feature in the Model 3 is controlled from the touchscreen or via voice command. This is thought to be a preview of the Model 3’s future use for self-driving ride-sharing service when it’s not being used by its owner. Tesla has mentioned such a service, and the car’s inward facing camera would let an owner record how any temporary occupants behave inside it. The two versions with different ranges clearly use battery packs of different capacities, though oddly Tesla has declined to give the capacity figures in kilowatt-hours. Their capacities are thought to be about 50 kwh for the base car, 75 kwh for the Long Range model. While Tesla is currently promising to start deliveries of all-wheel-drive versions in Spring 2018, the first several months of Model 3s were rear-wheel-drive only, using a 192-kilowatt (258-horsepower) electric motor powering the rear wheels. Tesla quotes acceleration times from 0 to 60 mph of 5.1 and 5.6 seconds for the Long Range and standard cars, respectively. There will likely be a much faster “P” performance model at some point in the future, however. No crash-safety test results have been released either by the NHTSA or IIHS for the Model 3, though Tesla has a good record in getting top safety ratings for the Model S and Model X before it. It comes standard with eight airbags and automatic emergency braking. All Model 3s include keyless entry, a 60/40-split folding rear seat back, dual-zone automatic climate control, cloth upholstery, an audio system with FM and streaming internet radio, and the central 15-inch touchscreen. They also come with wi-fi and LTE wireless connectivity, voice-activated controls, two USB ports, and standard navigation. 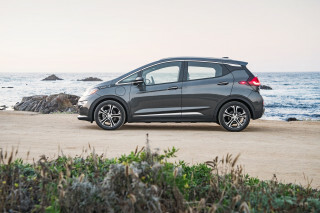 Options include heated seats with premium trim and upholstery materials, 12-way power adjustable front seats with memory settings that include the steering wheel and mirrors, a premium audio system, a tinted glass roof, heated and auto-dimming foldable side mirrors, LED fog lights, and a covered center console with smartphone docking to replace the standard open design. Potential Model 3 buyers should know that as of August 2017, Tesla said it had taken 455,000 reservations—each accompanied by a $1,000 payment. Not all of those will turn into purchases, of course, but Tesla says any car ordered in early 2018 won’t be delivered for 12 to 18 months, depending on configuration and buyer location. The shape of the 2018 Tesla Model 3 takes more risks than did the Model S, making it less immediately appealing, though the interior is simple and attractive. 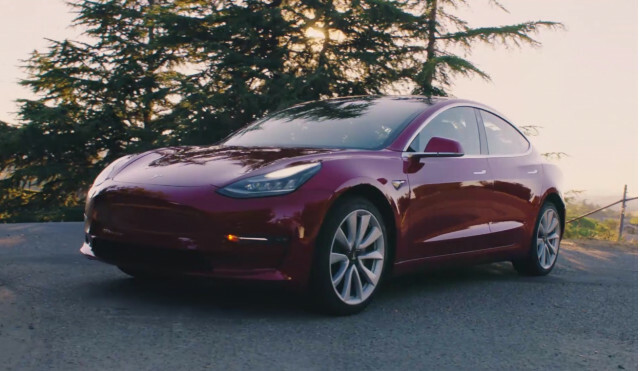 The 2018 Tesla Model 3 takes advantage of the different proportions allowed by an all-electric powertrain in a vehicle roughly the same size as a BMW 3-Series. It’s recognizably a Tesla but not as elegant as the larger Model S. The interior with a single 15-inch touchscreen for virtually all controls is plain and uncluttered. At least on the higher trims, though, the materials—leather, suede, and wood as well as the expected soft-touch black plastic—make it soothing and serene rather than stark. Despite its fastback shape, the Model 3 is a four-door sedan with a trunk, rather than the five-door “hatchback sedan” layout of the larger Model S. Its short front end has no pretense of a grille, but instead the flat, bluff panel a V-shaped Tesla emblem. That snub nose is all that’s required to house a motor (all-wheel drive will be offered in future), plus the requisite crash structures to protect occupants. It likely wouldn’t accommodate an engine and transmission of similar power, but this car will never be built with one. That allowed Tesla could devote more of the overall length to passengers—and to sculpt the entire body, with its high-tailed fastback shape, for minimal wind resistance and hence energy efficiency. Its minimal energy use at speed indicates the company has succeeded admirably. A few percent of that efficiency is attributed to the “Aero” wheel covers, which most viewers dubbed ugly. Are they worth living with for an extra 5 to 15 miles per charge? Many owners will think so. The Model 3’s dashboard area is far plainer than those of its larger siblings. The most striking feature is the 15-inch touchscreen that sits above an otherwise empty dash tray that’s entirely free of buttons, switches, knobs, or sliding controls. It’s intimidating to some novices (though it works better than we anticipated), but there’s no denying it’s elegant, minimalist, and futuristic. The minimalist character works especially well with a lighter upholstery color in the light-filled cabin provided by the glass roof. From inside the car, a steady sweep of glass runs from the base of the windshield to the bottom of the rear window, visually interrupted only by two slim cross-pieces to brace the structure. The ambience is as much designer living room as automobile, and that’s a plus. The 2018 Tesla Model 3 is fast, smooth, and holds the road well, though it’s not sporty per se. The two versions of the 2018 Tesla Model 3, offering ranges of 220 and 310 miles, clearly use battery packs of different capacities. Strangely, Tesla has declined to give exact capacity figures: They’re thought to be about 50 kilowatt-hours for the base car, and 75 kwh for the Long Range model. The first several months of Model 3 production used a 192-kilowatt (258-horsepower) electric motor powering the rear wheels only. The company has suggested it will start deliveries of its all-wheel-drive “D” version of the Long Range Model 3 during 2018, and the lower-range base version at the end of the year. A much faster “P” performance model is likely to be launched at some point in the future, probably after the “D” version arrives. Once on the road, Tesla’s always been good at providing a continuous flow of acceleration in fast, faster, and fastest versions. The Model 3 is no exception. Tesla quotes acceleration times from 0 to 60 mph of 5.1 and 5.6 seconds for the Long Range and standard cars, respectively. We weren’t able to time the acceleration of our Long Range test car, but that felt roughly accurate. In test drives through twisting roads in the greater Atlanta area, the Model 3 cornered predictably and held on tenaciously. 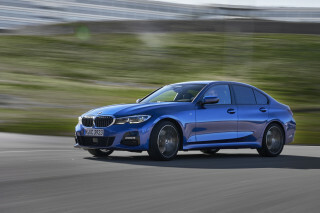 It’s no sport sedan, and it doesn’t beg to be thrown through corners with gleeful abandon, but it acquits itself well when a driver chooses to do that. Our main grumble about its on-road behavior was a tendency to wander slightly when driving straight ahead. That may be due to the car’s lack of toe-in; most makers angle the fronts of the front tires slightly inward, which improves directional stability. Tesla keeps them pointed directly forward, which reduces tire friction and hence boosts energy efficiency, extracting just a tiny bit more range from its battery capacity. Tire pressures count toward efficiency too: The car’s standard Michelin Premacy 18-inch tires run 50 psi or more. The Model 3 offers fairly strong regenerative braking, though drivers who prefer an “automatic-transmission feel,” complete with idle creep, can choose that from within the car’s settings. 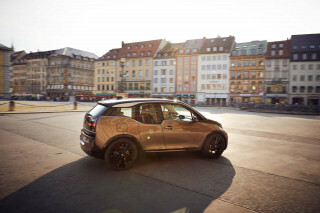 Lifting off the accelerator produced a pause before regen kicked in, however—unlike the BMW i3, Chevy Bolt EV, or the Nissan Leaf with “e-Pedal” enabled. Steering settings include Comfort, Normal, and Sport, but they appear to vary just the effort required to turn the wheel, not the steering ratios. We found the steering slightly on the heavy side, making it feel like a larger car than it was. The 2018 Tesla Model 3 is comfortable and quiet, but it’s the worst-built new car we’ve tested in years. Like its larger and pricier siblings, the 2018 Tesla Model 3 is comfortable to ride in, quiet on the road, and offers considerable cargo volume for its size. The build quality of the early car we tested, however, was appalling. Driving a Tesla Model 3 for the first time requires a bit of instruction. The “key” is actually a flat card that needs to be tapped on the middle of the center left-hand pillar to unlock the car, and again on the console to power it up. Setting the position of the seats and mirrors requires calling up those functions on the center touchscreen, though the mirrors are positioned with the two roller wheels on the steering wheel once you’ve done so. Aside from stalks for lights, wipers, and cruise control, and those steering-wheel roller controls for audio settings, every feature in the Model 3 is controlled from the touchscreen or via voice command. We found the voice input to be very good, until the car moved out of cellular range, when its ability to transmit to a cloud service for interpretation ended. Overall, though, once we got the car set up via the touchscreen, we found it quite natural to drive. And front-seat passengers have the car’s volume controls on their side of the touchscreen, so we ended up deciding that while it’s unfamiliar, the central display screen works far better than we had feared. The Model 3’s front seats are supportive, well-bolstered, and on the high-spec model we tested, power-adjustable in 12 different ways. The driving position is somewhat legs-out, as if the driver were in a low sports car, but that gives the front seats plenty of head room. The rear seat was comfortable enough, though as in the larger Model S, riders sit knees-up due to the absence of conventional footwells due to the battery pack below their feet. It could also use more bolstering at the front of the flat cushion, and its rear-seat backrest is reclined more than in other cars. That gives enough head room for all but the tallest adults at the cost of a less upright sitting position than some riders’ lower backs will prefer. Tesla learned a lesson when it launched the Model S without the usual cupholders and trays in its minimalistic center console, and the Model 3 offers those items as well as door pockets and a few other storage spaces. Though it may not appear to be, the trunk opening is actually big enough to fit even the largest suitcase. Including the very small front trunk, total cargo volume in this mid-size sedan is 15 cubic feet, about average for the class. The list of defects in our privately owned test car, delivered in February 2018, can be broken into two categories: those that affected the functioning or owner’s enjoyment, and those that didn’t. The first list included a defective command screen (replaced within days after delivery), persistent creaks and groans from within the console or dash, and an intermittent loud buzz from the upper right-hand central pillar at higher speeds. The second and longer list included a steering vibration (on a car with just 1,000 miles), misaligned body panels, widely varying panel gaps, the glovebox door not sitting square in its opening, and a flaw that jumped out to anyone looking at the car: badly fitted chrome door trim that didn’t align from piece to piece. To be clear, the cheapest Chevy, Honda, Hyundai, or Toyota wouldn’t make it out of the factory with any one of those problems, let alone the whole list of them. In fairness, numerous Model 3 buyers report receiving cars with no issues they could discern. But the rate of defects not only in all the Model 3s we’ve viewed, but also reported on Tesla forums, is cause for concern. Early Model 3 buyers and Tesla’s devoted fans and acolytes are likely willing to overlook them. Whether they should be is a different question altogether. No crash-test results are available for the Tesla Model 3, although the top safety ratings for previous Teslas give cause for confidence. The top safety ratings earned by previous Tesla vehicles are cause for comfort, however; the Model S structure was so strong that it legendarily broke the roof-crush rig being used to test just how much it could withstand. Every Model 3 comes with eight airbags and automatic emergency braking as standard. Adaptive cruise control is only available with the Autopilot package, which also bundles in blind-spot monitors, forward-collision warnings, active lane control, and automatic headlight control. 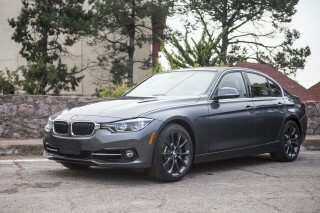 Otherwise, even top-end versions offer only conventional cruise control. The base 2018 Tesla Model 3 is adequately equipped and higher-end models offer most features expected for the higher price, though safety features are oddly bundled. The 2018 Tesla Model 3 competes with such small luxury and sport sedans as the Audi A4 and BMW 3-Series, and its base model is adequately equipped to match their base versions—some of which are sparser than you might expect. Adding optional features brings up both the price and the equipment level to match the higher-end versions of those cars. All versions of the Model 3 come standard with keyless entry, dual-zone automatic climate control, cloth upholstery, a 60/40-split folding rear seat back, an audio system with FM and streaming internet radio, and the signature central 15-inch touchscreen. Wi-fi and LTE wireless connectivity, voice-activated controls, two USB ports, and standard navigation are also included. Android Auto and Apple CarPlay are not available on the Model 3. 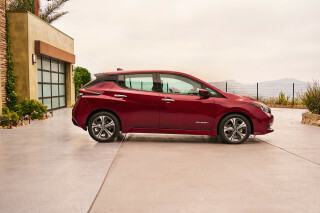 The Long Range model provides a bigger battery pack and boosts the range from 220 to 310 miles for $9,000 more. The Premium Interior package, at $5,000, adds numerous features that make the cabin more appealing. Those include heated seats with premium trim and upholstery materials, 12-way power adjustable front seats with memory settings that include the steering wheel and mirrors, a premium audio system, a tinted glass roof, heated and auto-dimming foldable side mirrors, LED fog lights, and a covered center console with smartphone docking to replace the standard open design. The Autopilot package, which bundles several active-safety features, adds another $5,000, and the future Full Self-Driving Capability—promised for some indefinite time in the future—a further $3,000. The all-wheel drive “D” option, when it becomes available, is also likely to cost a few thousand dollars. Metallic paint colors add a further $1,000, and the mandatory delivery fee is $1,000 on top of that. While the Model 3 was widely promoted as the $35,000 Tesla offering 200-plus miles of range, the reality for much of 2018 is that orders are being filled only for the Long Range version (starting at $44,000). Moreover, the majority of Model 3s delivered to date have been high-end versions with prices of $50,000 to $60,000. As a battery-electric model with ranges above 200 and 300 miles, the 2018 Tesla Model 3 gets our top score for offering both zero tailpipe emissions and practical usability. 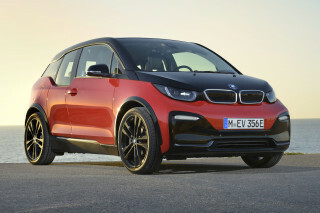 That rating compares favorably to MPGe ratings for much smaller and slower electric cars. It’s just slightly lower than the 2018 champ, the Hyundai Ioniq Electric at 136 MPGe, and the Model 3 beats both the Chevy Bolt EV (119 MPGe) and the latest Nissan Leaf (112 MPGe). All Model 3s use the Tesla-specific charging plug, and the currently available Long Range model can charge at up to 40 amperes, while the base model will run at 32 amps. They are able to fast-charge via the Tesla Supercharger network for long-distance road trips. Supercharger use is not free to Model 3 owners, however, as it has been until recently for Model S and Model X owners. 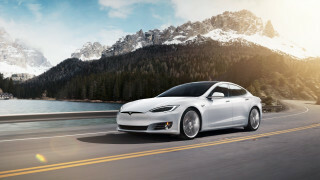 Drivers can also use the “destination chargers” installed at high-end hotels, shopping centers, golf courses, and other venues Tesla feels its owners are likely to visit. The Model 3 comes with an adapter cable to allow use of public charging stations with the standard J-1772 cable and plug fitted to every other electric car sold in the U.S.
What a sports car! And it sits 5 people! Having owned almost 100 cars in the last 40 years, I believe this review has missed the mark. I'm not willing to "over look" the flaws on my model 3 as the reviewer suggests... There are no flaws. I have owned some notable early builds: My "new" Beetle and Mini cooper S stopped traffic the first six... I'm not willing to "over look" the flaws on my model 3 as the reviewer suggests... There are no flaws. I have owned some notable early builds: My "new" Beetle and Mini cooper S stopped traffic the first six months I drove them, and to some degree so did my Cayman S. Those cars ALL had build quality issues; Porsche took the cayman back for several days to "fix" something, then sent me 1000.00 for the hassle! The press LOVED those cars... and rightfully so! But the 3 IS one of those great cars... better in most ways. No one talks about the fact that I can drive the same 800 mile days i can in my ICE cars. and at the same pace, thanks to the super charging network. I think the accomplishment made by the folks at Tesla is nothing short of miraculous. They are always being compared unfavorably to automotive giants like GM in terms of volume and profit Why not look at a company like Porsche? Porsche is after all a highly respected brand (but lower then Tesla), high profit (at one time the highest) per unit sold and only 230,000 produced ANNUALLY! I picked up my Model 3 extended range Tesla mid February. It doesn't remind me of the review that I read in Car Connection in any way. I share my car broadly. I'm talking with people all the time about it they... I picked up my Model 3 extended range Tesla mid February. It doesn't remind me of the review that I read in Car Connection in any way. I share my car broadly. I'm talking with people all the time about it they seem equally impressed with the attractive styling. When I give them a chance to go for a test drive they report comfort in the back seat. The passenger perspective is consistently positive.